Lewis Hamilton (2nd, 1:38.710): "The first session of the day was good, even though it might not show on the timesheets as we didn't use the HyperSoft tyres. We got through our programme, tried some different options and got some good results from it. We were close to the Ferraris, but we will only find out tomorrow how quick they really are. The guys have been working so hard both here at the track and back at the factory to improve the car and it is definitely feeling better than it did in the past. The track is incredible; we're a lot quicker than we were last year, but that also makes the lap so much harder than it was even last year because the G forces have gone up, we need to react quicker and it is crazy hot in the cockpit. You're sweating even before you get into the car; in the second session, I think I lost almost two kilos, so I will lose even more on Sunday. We will see how it goes tomorrow, but it's looking like it might be a three-way fight between Ferrari, Red Bull and us." Valtteri Bottas (5th, 1:39.368): "It's been a very hot day and overall a quite positive day. In FP1, we ran in the end on the Soft tyres when others were using the HyperSofts or UltraSofts and we knew how much we'd improve on the other compounds. So FP1 already looked a bit better than last year. In FP2, both Ferrari and Red Bull looked very quick, but we were not far off. The car has been improved massively in the high-downforce trim. It is much quicker, even compared to the beginning of the season. The fast cars also make it more challenging - the quicker you go, the more G forces you have to pull. It's especially tough around this track as it is so hot - it's a bit like doing exercise in a cockpit that's 60 degrees hot. We made big changes from FP1 to FP2, not all of which were positive, so we'll work on this overnight. It's extremely difficult to get the balance perfectly right on this circuit, there's such a wide range of corners, so we have a lot of work to do. I think we have a lot of possibilities for a good result this weekend, but we need to get the car absolutely right to challenge Ferrari and Red Bull. I didn't get a really good lap together, but it seemed like the pace was there, so hopefully it's going to be a really close qualifying tomorrow." James Allison, Technical Director: "With the exception of losing an UltraSoft tyre set with Lewis this afternoon through a lock up, we enjoyed a pretty reasonable day. Both cars had too much understeer in the first session, which we were able to dial out during the break, and we got the car pretty happy for a single lap in the second session; likewise, the long-run pace seems to be in the mix. There is still more work to do: we want to cure some nervousness under braking and Valtteri's balance wasn't quite right in his long runs. But if we compare the situation to what we experienced last year, then today's running makes us more confident that we are in the hunt this weekend." Max Verstappen (3rd, 1:39.221): "It wasn't the perfect day for me, we still have plenty of room to improve ahead of Qualifying tomorrow. This mornings practice felt good but I wasn't entirely satisfied with the second session. This afternoon we could have been a bit quicker over the short runs as we suffered a bit from understeer. I don't think we have the pace to fight for pole so we will just try to optimise the package. Once we have, short runs and race pace should improve. It definitely wasn't a bad day, some hard work tonight should put us in a good position with ability to attack. The Hypersoft struggled over the long runs, it dropped off quickly. The other compounds were not so bad which could make the race interesting." Daniel Ricciardo (4th, 1:39.309): "It's going to be close at the top and all three teams can be fast around here. The morning session was better for us and surprisingly we were a bit more comfortable with the hotter track. Once it cooled down this evening, we didn't feel we were able to optimise everything. I'm not concerned, we have tonight to analyse everything and I believe we will bring it all together tomorrow. I like that they brought a Soft tyre which is a few steps harder than the Ultra and the Hyper which opens up more options for the race. Each tyre seems to be a good step faster than the other, so for Qualifying I think it will push everyone to use the Hypersoft. It was fun out there. It's the toughest circuit both mentally and physically but I love it and it's a good challenge. I'm sweating a lot but it's worth it. I've prepared well and the team has brought a very good car here, so let's hope the gap is close tomorrow." Sergio Perez (11th, 1:40.774): "Singapore isn't the easiest place to introduce aero updates to the car, but we did what we could and tested all the new parts. There was quite a big change to the characteristics of the car and it's going to take more time before we fully understand how we can maximise the set-up. The balance still needs improving and there are some decisions to take tonight to make sure we get the best from the car tomorrow. Apart from testing the new items, we did all the usual work and collected the data for the race so it feels as though we are in good shape so far." Esteban Ocon (13th, 1:40.870): "It wasn't a bad start to our weekend. I think the pace of the car is quite good and we can be in the mix for the top ten tomorrow. The middle of the pack is very tight once again, so getting each sector just right is going to be especially important during qualifying. A small mistake will be very costly in terms of grid position. The work we did today was very valuable, including the first experience of the updated car. First impressions are positive, but it's still too early to know how much performance we have found from the new parts." Otmar Szafnauer, Chief Operating Officer: "It was a very busy day of testing with a lot of new parts to evaluate on the car and also three very different tyre compounds to assess. The upgrades we were waiting for seem to be working as planned. More analysis and understanding is needed, but the initial signs are encouraging. In Singapore, track time is essential and both drivers covered plenty of laps as we completed the run plans with both cars. So we have good data and much to analyse, which is important. There are still some improvements to be made to the balance and we expect it to be very tight in the midfield." Lance Stroll (19th, 1:42.141): "We got some good running in and covered a good number of laps, so we learnt a lot. We are struggling with grip and just outright pace this weekend. It is the nature of the track, as high downforce doesn't suit our car. At the end I had a small fire in the right rear brake due to a tear off. I am not sure if it was my tear off or someone else's, but it was unlucky. We will see what happens tomorrow, as it's another day. Last year I started 18th and finished eighth, so who knows what will happen - maybe a bit of rain!" Sergey Sirotkin (20th, 1:42.181): "It has been a difficult Friday, in FP1 we looked very reasonable with the tyre compound and we had a lot of margin. But, that wasn't the case in FP2, with the sun going down and with lower track temperatures we were expecting to see improvements from FP1.The outcome of both sessions wasn't what we expected today, so we have a lot of work to do tonight to make sure we maximise everything ahead of tomorrow." Paddy Lowe, Chief Technical Officer: "One of our main objectives for FP1 was for the drivers to get to know the circuit, as it's very long and quite complicated. As Sergey hadn't previously driven in Singapore, this was particularly important. We also conducted several aerodynamic tests on each car. In FP2, we did our first running on the hypersoft, we didn't make as big a performance step as other teams appear to have. The overall car pace is not good at all. In addition, Lance had a rear brake fire, which unfortunately lost him his long running this evening. We think this is due to a driver's helmet tear-off, which blocked the brake duct. Overall, it has not been a great day and we need to do a lot of work to improve for tomorrow." Carlos Sainz (6th, 1:40.274): "Overall, it was a pretty straightforward Friday for us, which is always good in Singapore. We had no issues and completed our run plan. I'm happy with today, especially the performance of the car over one lap. We have areas to work on, particularly our long runs to see what we can do better for the race. We have some things to learn on tyre degradation, but in general it was a good day for us." Nico Hulkenberg (10th, 1:40.668): "It's always great to drive this track. We started the day well, but then I didn't think we were able to make as much progress in the second session as I'd have hoped. In particular, I think we have to look a bit closer at controlling the rear end, but that does mean that we have a clear area for focus ahead of FP3 and qualifying tomorrow. Overall, a positive day, but you always want more." Nick Chester, Technical Director: "A productive day for us at a track we expect to be more aligned with the characteristics of our car than at recent locations. We ran with new bargeboards and sidepod vanes on Nico's car and the data was positive so we're hoping to have these for Carlos tomorrow too. It was the usual engineering challenge in Singapore of a non-representative FP1 because of running in much hotter conditions than we do for FP2, qualifying and the race, nevertheless we feel well-prepared heading into the rest of this weekend at this unique circuit." Brendon Hartley (17th, 1:41.542): "It was nice to experience Singapore for the first time. I had a pretty smooth day with no dramas on the car and made no mistakes, although there's some more time to find on both cars as we're still aiming to move up higher on the grid for Qualifying. I got up to speed very quickly with the track, and the tyre management on the long run looked very good, but there's still quite a bit of work to do overnight before final practice tomorrow." Pierre Gasly (18th, 1:41.615): "It was a pretty difficult day for us. In terms of performance we are not as competitive as we had hoped, and at the moment we are struggling a bit with the balance. We're lacking pure performance so we need to take some time tonight to work out why, and analyse all of the data to find what's wrong so we can improve the car for tomorrow. The Singapore track is mega, especially in the night! It has so much rhythm, it's technical which challenges the driver in these hot conditions, and there's such a great atmosphere. It's really enjoyable, but at the moment I'm not feeling too great with the car, so we will work hard and try to come with some changes tomorrow to better our performance." Jonathan Eddolls, Chief Race Engineer: "It was a tricky afternoon and evening for us in Singapore. We came here expecting to be more competitive as the track should suit the characteristics of our car, however, the positions we found ourselves in after the practice sessions didn't reflect where we should be. Neither driver has experience at this circuit, so we prioritized giving them as many laps as possible to familiarise themselves with the track. The Singapore street circuit has more corners than any other on the F1 calendar, so it's a difficult one for the drivers to perfect. We had a number of mechanical and aero setup tests to carry out in FP1, and we obtained quite clear answers from these which gave us a good direction heading into FP2. Our main problem today has been extracting peak performance on the first lap from the tyres, particularly on the Hypersoft. We were the standout team as almost all others were able to get their fastest lap on Lap 1. Some of it is due to the balance of the car, which we need to continue working on for tomorrow, but the rest we believe needs to come from optimising the tyre operating conditions. We have a good idea of where to focus our attention and we have two sets of Hypersoft tyres to test these theories tomorrow in FP3, so we remain positive that we can find the single lap performance we are lacking. Our long run pace looked reasonable, but we know it's all about Qualifying performance here, so this will remain our focus tonight." Toyoharu Tanabe, Honda F1 Technical Director: "We had a trouble-free three hours of track time, supporting our chassis and aero colleagues as they tried different settings. Both drivers did a lot of laps, which is particularly important as neither of them has ever driven at this circuit before. That gave us plenty of data, which is useful, because as you can see from the timesheets, we still have a lot of room for improvement. We will now analyse our short and long run figures to improve several aspects of the package, including energy management." Romain Grosjean (7th, 1:40.384): "It was alright this evening. We were better than we were in the afternoon, which is always a good sign. There are a lot of things we can still improve on the car, as always on a street circuit. I think it's difficult for everyone getting the tires to work. Hypersofts to softs is quite a big difference. We just need to make sure we're good on every compound. The car felt ok, but there are a few more things we can do to get a bit faster. That said, I'm happy where we are." Kevin Magnussen (15th, 1:41.154): "We didn't really have any problems, but on my side, we just didn't really hook it up to get any kind of competitive lap time. Romain showed that the car is there. I just kind of have to put my stuff together and get it out tomorrow. It gives me confidence to see that the car can do it. We'll work hard tonight and try and put it together on Saturday. It's going to be a close fight in the midfield. It'll be difficult to make Q3 in qualifying, but I'm positive that we can improve for tomorrow, at least." Guenther Steiner, Team Principal: "We started off our Friday a little bit behind, but everybody did a good job. In FP2, we made a clear step forward. There's nothing major to report. We had a good session, and the speed, we're getting there ahead of qualifying tomorrow." Fernando Alonso (8th, 1:40.459): "It was a positive Friday. It's always amazing to be around these streets at these speeds. We tried some interesting stuff, also comparing different configurations on the two cars. We gathered good information about the tyres and about the set-up changes that we were managing in both free practice sessions, and we will go through them tonight. I managed to get quite a good amount of laps under my belt, which on a street circuit is very important as the more running you get, the more confident you are. It's going to be a close battle to make it into Q3 tomorrow, but qualifying position is very important here so we are giving priority to our Saturdays performance. Track evolution we know is huge in Singapore, so you try to follow the track conditions as well, and I think our preparation for tomorrow's qualifying is okay." Stoffel Vandoorne (16th, 1:41.164): "It was definitely not the easiest of Fridays, especially in FP1. We missed a lot of track time with a couple of problems on the car. Around a circuit like Singapore it's definitely not ideal because the track keeps evolving so much, and you need laps to find your rhythm and build up during the weekend. We started a bit on the back foot, but I think we recovered pretty well in FP2, finding my feet in the first run and having a reasonable run at the end. By the time we ran high fuel I think the pace was pretty competitive. We did a lot of laps in FP2 and I'm looking forward to hopefully having a clean day tomorrow. We learned a lot today, especially about the Hypersoft tyre. We've done a lot of tests across both cars so now it's going to be super important to put all the pieces together tomorrow. This race is massively favoured towards qualifying because the higher you can start, the better it will be for the race. It's a bit too early to talk about tomorrow. We're probably a little bit more competitive around this circuit because the power sensitivity is lower, so I think we should hopefully be a little bit higher, but we know that tomorrow the others will improve as well." 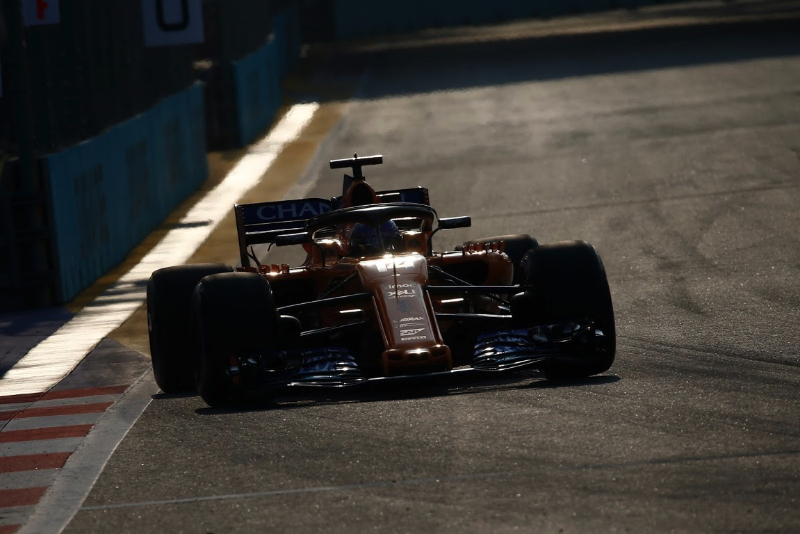 Gil de Ferran, Sporting Director: "It's disappointing that we had curtailed running in FP1 with Stoffel, for which, on a difficult circuit like this, you pay a very high price. However, both he and the team have recovered well in FP2. Fernando also had a more competitive Friday than of late. As usual, we went through several test items today and I think we have a clear direction for tomorrow." Marcus Ericsson (12th, 1:40.812): "It was a good day. We tested all of the different tyre compounds for the weekend, which is a positive start. It is a tricky circuit, with various types of corners and high temperatures making it a challenge to drive. We learned a lot today, and the car felt good. We are reasonably competitive, and have some work ahead of us to advance in what is still a very tight midfield. I look forward to being in the fight tomorrow." Charles Leclerc (14th, 1:41.062): "It was an interesting day for me. I drove on the Marina Bay Street Circuit for the first time, which was exciting. The track lives up to its reputation and is a good challenge, especially in terms of tyre management. FP1 went well. I made a small error at the end of the session and touched the wall, but thankfully we had already gone through the planned programme and didn't lose any running time. The team did a great job in fixing up the car in time for FP2. The second session took place at night, which is more representative of the conditions we will have during qualifying and the race. We are competitive and will work hard tomorrow to fight for good start positions. I look forward to being back in the car."